North of Narrabri: So, how does it pull? So, how does it pull? Now that I've got a Powerline new 48 Class as a guinea pig to compare to the other two branchline locomotives on the layout, Trainorama's 47 and 49 class, I'm naturally curious as to how much grunt the little locomotive will have. My crossing loops are 6 1/2 actual feet long, sufficient for a single branchline locomotive, 10 WTY-code grain wagons, and a guard van. So, it'd be nice if a train of this size can be pulled by a single PL 48 up the 2.5% gradient of my corner helix. 13 FWH (Tranorama) wagons + van. Weight of 1097g, a "scale" tonnage of 895 tonnes. 9 WTY (Auscision) wagons + van. Weight of 920g, a "scale" tonnage of 753 tonnes. 10 WHX (AR Kits, weighted approx 82g per car) + van. Weight of 903g, a "scale" tonnage of 744 tonnes. The PL 48 nicely handled the grade with 12 FWH wagons + 2 heavy Austrains WHX cars+ van; it also had no problem with 10 Auscision WTY + van. 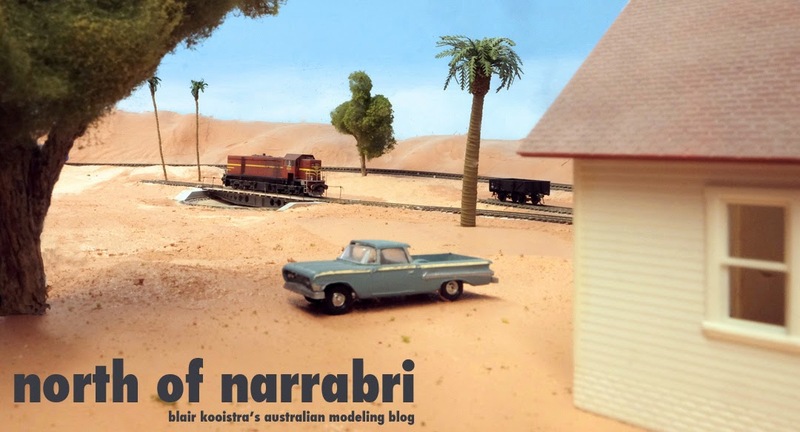 For its weight, it easily matches the Trainorama locomotives in pulling ability, and the loco depot shouldn't be shy about assigning it a full load on assignments out of Narrabri. LATE UPDATE: Felt compelled to try to give an 8 car rake of Austrains WHX cars (151 grams/each) and a van up the grade, and it just managed. . . 1208g plus the van. . .these roll quite well also. Curious: anyone know the tonnage rating of a single 48 class on the 1:40 Ardglen grade? I'm guessing the model is pretty comparable. Darren, still have got to order a replacement for the "don't touch" powerline board--I'll be gettin a TCS A6X--it's got built-in resistors for LED's as well as 1.5v output for incandescent bulbs. Looks like a good non-sound choice. At some point, when DCC Sound in Victoria gets their 830/48 project for a LokSound board completed, I'll look at either adding that or a Tsunami sound decoder. I don't have my WTT handy but IIRC, 48cl load both sides Ardglen was 400tonnes. Same load for 47 & 49cl. I just heard the sound of the Loksound 251 & I would not waste my money on it, hopefully DCC sounds will get the air horns right, I don't know how they will go about getting the right air horn for the MK4 48's though also the same type was on the 47cl an RVB 5chime. The problem with the Austrains WHX is the autrocious over wieght in them, while they are free rolling they need to be to try to compensate for them being far too heavy. Don't forget to reduce the overall load by 10% if you have mixed engine classes on a train. Generalised operations over the Liverpool ranges (Ardglen is atop of these ranges) was to roster engines up to cater for 1:80 grades (so double the loads above) if going through to Newcastle and use bank engines to push up the hill from Willow Tree to just before Ardglen tunnel, for the other half of the train weight. A Long Dry Spell. . .